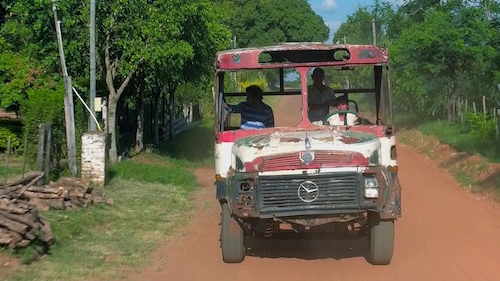 For a long time, Paraguay was cut off by a dictatorship that lasted nearly 35 years. The country is getting back to work, the economy is taking off, except in the Chaco. The region covers half the country and yet only has one inhabitant per km2. People are trying to find a place in the midst of this wilderness with its extreme climate: depending on the season, the thermometer goes from 0o to 50o. The roads across the Chaco are hardly ever maintained and moving from one place to another requires courage, especially during the winter rains. We went along with one of the rare drivers who takes the risk… that’s why the locals call him “Michelin”. “They call me Michelin because they’re tires that never burst!” Aged 67, he has no retirement pension, so he continues to work as a transporter in his old van. Despite the hostile climate, strange colonies of men and women are settling there. Beneath their hands, the forest is giving way to vast fields. The Mennonites dedicate their life to god and reject any form of modern society. Their dress code dates from the 18th century and they only drive around in carriages. These Protestant Christians from Germany, or even Alsace, are mainly blond with blue eyes and only marry among themselves. The Chaco is also the land of make-do: you can easily come across a vehicle that seems right out of a Mad Max movie. A vehicle unique in the world, half-bus, half-truck !